Two-and-a-half years ago, my life looked like this. I was stuck in a dead end relationship, I was trying to persevere in order to get my MA and EdM, and I was terrified of being a single mother (although I felt as though it would come to that eventually). Today, my life looks like this and this. Aiden is a happy, well-adjusted kid and a joy to be around (98.9% of the time), I found my single mommy groove and it has become my "new normal," I wake up every morning and get to do the most important work, and both my freelance gigs and career are doing pretty well. But most importantly, I'm living my life on purpose and with purpose. I'm not bragging. I don't do it very well. But, I was having dinner with my girl this past weekend and I was illustrating to her how having a clear vision can keep her moving forward, in pretty much every aspect of her life. Two-and-a-half years ago, I looked into the mirror and the image that I saw did not align with the image that was in my mind. I was unhappy with the reflection that I saw and my vision was blurred. But that's qutite alright. These things happen from time to time. Life has a way of testing our vision and seeing if we're willing to do whatever it takes to stay the course, bounce back when we encounter setbacks, and keep pushing forward. Two-and-a-half years ago I was in over my head about how I was going to move forward, and I wanted a miracle. I didn't get one. Instead, I came up with a plan. I thought of actionable steps that I was going to take beginning that very day in order to align my reflection in the mirror with the image that was in my mind. And that's exaclty what I did. Step... by step... by step. Over the past couple of weeks, I've been receiving lots of messages and emails from readers asking questions along the lines of "How did you get where you are today?" 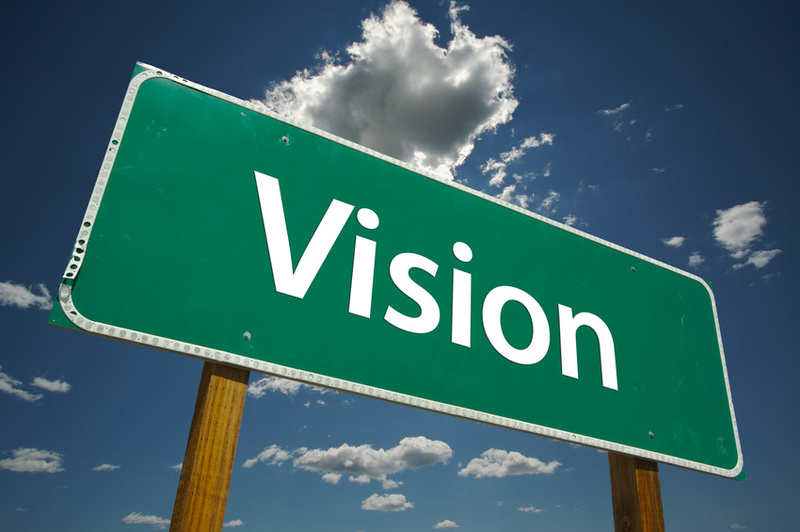 Now, I'm throwing a question back out to you guys: what is your vision for your life? What are the actionable steps that you're taking to make it happen? My vision...doing what I love doing and finding a way to get paid for doing it. Total bliss. I love your story, it's so inspiring. Yes, a vision is necessary to see where you want to go. I'm living a vision I thought about a long time ago. It's a work in progress, but I'm getting there. I'm similar in that way - I visualize exactly what i want out of my future (even going so far as to create a Hope Chest and/or vision board) and i find that it really does manifest itself, thru hard work and positive thinking. Awesome story! Hang in there. The vision I have for my and my daughter's life is grand! I'm stepping out on faith, regardless of if I can see the path or not. I know that if I take care of the "why" (because it's my purpose), He will take care of the "how." Great post! So true..without a vision you work harder and there is no clear path to success. A plan is such a great way to go. Again, you hit it on the nose! My hubs and I were talking about our visions the other day! We need new visions, new direction for the next steps in our lives. I think we have been at a stand still for a almost 2 years now. Faith without works is dead. Awesome post. Much needed today, as I am attempting to create and successfully finish a vision board; one for myself, the other for my kids and I. Willing to accept any detour God has for my life, knowing that Romans 8:28 is true, In all things NOT some things, but ALL things God works for the good of those who love him, who have been called according to his. Yep, vision is important, and I don't see how I could have done all of this without one. I knew how I wanted my life to look at this point, and thank God for having a plan very similar to "mine." My current vision includes even more faith in him (and lots of work on my part), so I know good things await. Great post! i have to agree with some of the ladies...i definitely want God directing my path at all times..and without him i feel as nothing i do or touch will go very far. this was a thoughtful post as usual...you are such a great writer! You've been through hell and managed to pull yourself up. You are one strong woman, Alicia! I still have no clear vision of who I really want to be, and what I want to happen in my life. Yes, after the vision, comes action. I hope I get there too someday.